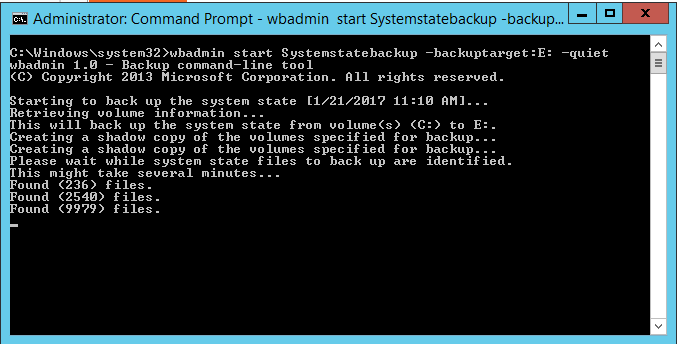 Descriptions: Even when you are trying correct commands to perform systemstate backup on windows server 2008 or 2012 using wbadmin (e.g. 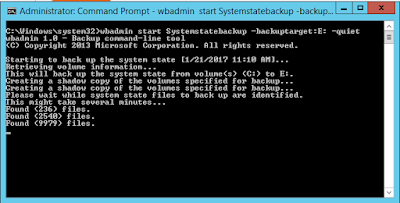 the command ‘wbadmin start systemstatebackup -backuptarget:E: -quiet’ is correct but ends with error), it is being encountered with error ‘the value for option backuptarget is missing’. Possible Reason: You have recently installed powershell along with windows backup feature and trying to perform systemstate backup without taking server reboot after the installation of this feature. Remember, I said always think of taking reboot after installing anything on windows operating systems. Wait till the backup is completed successfully. Cheers...please write me back if you have any query or feedback.